David Kellogg Cartter was a U.S. Representative from Ohio, and later a diplomat and federal judge. Born in Jefferson County, New York, Cartter pursued preparatory studies, reading law in Rochester, New York and being admitted to the bar there in 1832. He commenced private practice in Rochester, moving four years later to Akron, Ohio, and then to Massillon, Ohio, where he continued the practice of law. Cartter was elected as a Democrat to the Thirty-first and Thirty-second Congresses. 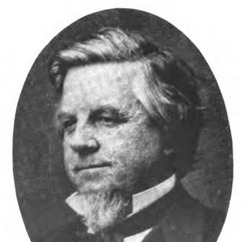 He served as chairman of the Committee on Patents. He moved to Cleveland, Ohio, in 1856 and continued his law practice. He served as delegate to the 1860 Republican National Convention, and served as spokesman for the Ohio delegation as it cast the votes to clinch the nomination of Abraham Lincoln. Lincoln, as President, appointed Cartter to be United States Minister to Bolivia, for which he served from March 27, 1861, to March 10, 1862. On March 10, 1863, President Lincoln nominated Cartter as Chief Justice of the newly established Supreme Court of the District of Columbia, created by 12 Stat. 762.